Frédéric R. Bouché, owner and winemaker, comes from a long line of winemakers beginning with his great great grandfather in the Buzet appelation of the Bordeaux region of France. Later, his great grandfather, Armand Bouché, moved to the Calvados appelation region in Normandy where, in 1919, he started his own winery. 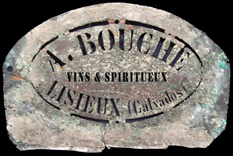 After his death, it was taken over by Robert Bouché, Frédéric’s grandfather, and then later sold by his father, Gérard Bouché, in 1994. This is where Frederic learned how to make and care for wines. Nine years after arriving in the Finger Lakes region, then an up and coming AVA, he began plans for his own winery.